On December 1st 2008, the John S. and James L. Knight Foundation recognized MWCC as one of 31 recipients out of 1,643 original applicants for its Knight Arts Partnership grant. With $8 million distributed to arts projects in South Florida, Knight Foundation awarded MWCC with a matching grant of $750,000 over four years. This is a tremendous opportunity for MWCC to set the pace for a greater film industry in Miami. MWCC will operate within all aspects of filmmaking: preproduction, production, post-production, promotion and distribution. MWCC works with high schools, universities, local professionals, producers, distributors and festivals to enhance creative talent and increase independent film production. The long-term goal is for the MWCC logo to be a signature of high quality for films produced in Miami. From left: Directors Joshua Miller and Sam Rega with Sanjeev Chatterjee (Director of One Water). Miami Noir won 1st place in the International Collegiate Competition in the documentary category in the 2008 Fort Lauderdale International Film Festival. Collegiate Competition winners screen on Tuesday, October 28, 2008 at 5pm at Cinema Paradiso theater. Writer Bari Lieberman blogs about the Wolfsonian screening for Boca Raton Magazine. You may have to scroll down as more blogs are added on the site. "Although I no longer live in Miami, a city famous for its beaches, nightlife, diversity and scandals, I can't quite get the "Magic City" out of my system just yet. To satisfy my recent Miami craving, I drove to The Wolfsonian-FIU on South Beach this weekend to screen my friends' documentary, Miami Noir: The Arthur E. Teele Story." Miami Noir and Jorge Valdes-Iga's short, Milia, screened at The Wolfsonian on Sunday, August 24 at 3PM to a packed house and lively Q&A session. Thank you to everyone who attended the screening and to Cathy Leff, the director of the Wolfsonian, for organizing the screening. Sam Rega, Josh Miller, and Jorge Valdes-Iga appear on CBS4-My33 Jim and Jade in the Morning to promote screenings of Miami Noir and Milia at The Wolfsonian. 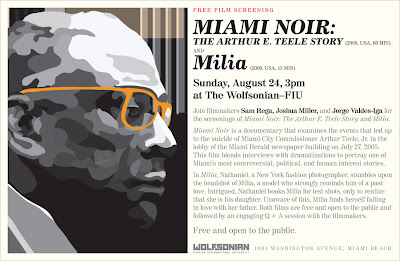 "Local filmmakers Sam Rega, Joshua Miller, and Jorge Valdes-Iga present their films Miami Noir: The Arthur E. Teele Story and Milia at the Wolfsonian-FIU on Sunday, August 24 at 3pm."